So by now unless you live under a rock that's under another rock... you know that Haiti got hit hard with an earthquake (7.0) yesterday January 12, 2010. Most of Port-au-Prince is ruined, many are dead, hurt, and homeless... this is of great sadness and just boggles the mind as to why mother nature chose them. Haiti is one of the poorest countries in the Western hemisphere and have had many economic hardships, with this disaster it will unfortunately continue for the good people of Haiti. So if there is any way you can help, please do as they need the 5-10 dollars we spend daily on lunch more than we do. Peoples lives and homes are a stake here, and everyone deserves the help. It's not everyday a natural disaster occurs, especially one of this magnitude. There has been a major problem as of late in Dominican Republic against Haitians and now in this day and age is not the time to fight over pettiness and things that can get worked out. I urge all people in Dominican Republic that have anything against anyone from Haiti to squash that forever and do something to help save families and give to let life flourish. If anyone has any other ways to donate, please leave a comment with links or details. 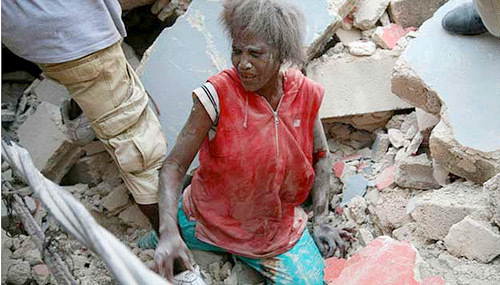 Cellphone: Text “HAITI” to 90999 to donate $10 to Amer. Red Cross relief for Haiti. Exhibit C my man Rasheed!